Quonset buildings have a fascinating history that predates the use of the building term ‘Quonset‘ itself. The term ‘Quonset’ comes from an Algonquian First Nations word meaning “small, long place”. That definition seems to fit the buildings themselves, but it’s actually referring to a peninsula. Read on for a brief history of these amazing buildings and answers ‘Where did the name Quonset come from’. What is the Definition of a Quonset? 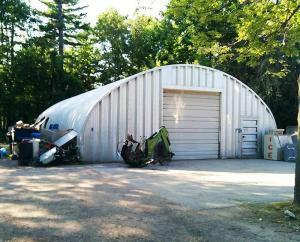 The word Quonset has become synonymous with arch steel buildings. You can see a classic version of this building style in the image on the right. The semi-circle design is still the most common shape due to its strength and ease of design. Recently other shapes such as those with straight walls, have been gaining in popularity for aesthetic reasons. This design of building existed long before it’s association with the word ‘Quonset’ however. Where did Quonset Huts come from? As mentioned, this style of building existed long before the common name. They were first introduced during WWI. Initially, this building was referred to as Nissen huts after their inventor, an engineer named Major Peter Norman Nissen. While they were introduced during WWI, their popularity and potential was better realized in WWII when the US began using them extensively. For this reason, many people associate Quonsets with the military. Today we find that most modern quonsets are used for agricultural and residential purposes. The building name ‘Quonset’ itself actually comes from a peninsula in North Kingstown Rhode Island called ‘Quonset Point’. We’ve found records of the buildings being manufactured at its Davisville Naval Construction Battalion Center as early as 1941, however as we know this style of building was being produced prior to 1941. Where did the word Quonset come from? The word ‘Quonset’ is derived from an Algonquian word which translates roughly to “small, long place.”. 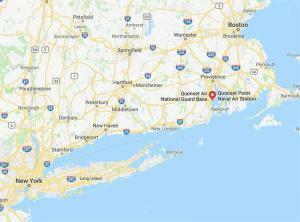 The Algonquian people were native to the region that came to be known as ‘Quonset Point’, and while the definition of the term fits the building, ‘small, long place’ would be referring to the point itself which is a peninsula. 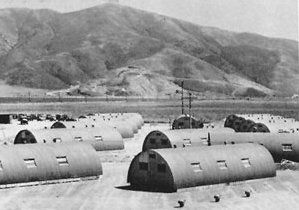 It’s unclear why the buildings changed from being called Nissen huts to Quonset Huts. Presumably, it’s because they were first mass-manufactured here and as a result, their popularity grew and became more closely associated with the location in which they were made. The durability and reliability of Quonsets has been proven repeatedly. If you’re interested in owning a little bit of history and one of the most durable, trustworthy building styles of all time, then price a quonset here and see why they’ve recently been growing in popularity and affordability.